A contract from the U.S. Navy means jobs retained in northeast Wisconsin. Congressman Steve Kagen reacts to the news that the Navy has awarded a contract to Lockheed Martin for construction of a new Littoral Combat Ship at Marinette Marine . "They&apos;re building great ships, and the Navy has rewarded them and their employees with another LCS contract." 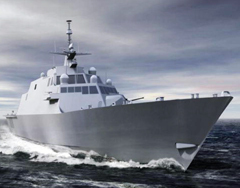 According to Marinette Marine, the LCS contract will prevent more than 200 previously announced layoffs and another 100 that were being considered. Kagen says it&apos;s a huge boost for the area&apos;s economy. "These hundreds of millions of your tax dollars that are coming back to northeastern Wisconsin, they&apos;ll percolate through the economy three, four or more times," says Kagen. The LCS-3 contract awarded to Marinette Marine is one of the two LCS contracts the Navy is expected to award this year, and marks the second such ship to be constructed at Marinette.